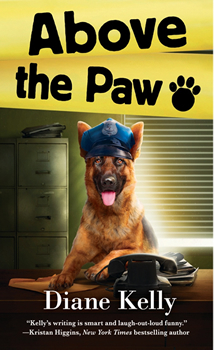 ABOVE THE PAW is the fifth book in Diane Kelly’s series featuring Police officer Megan Luz and her K-9 dog partner, Brigit. I hope readers will learn some fun and interesting things about K-9s and their handlers. I also hope the funny parts will brighten their day. This book explores the reasons behind the crimes, why people do what they do. It also expands the genre by showing how police officers can utilize the special skills of a K-9 partner to solve crimes. I discovered that the plot line I’d come up with—a drug ring on a college campus—was far more common than I’d realized, and that many have involved large numbers of students and huge sums of money. There’s some personal depth to the book, too, as my officer tries to help her firefighter boyfriend reconcile with the mother who abandoned him. Authors who have influenced me are Erma Bombeck, Dave Barry, Carl Hiaasen, and Janet Evanovich. All of them made me laugh, and I wanted to do the same thing for other people. The world could use more laughter. A former Assistant Attorney General and tax advisor, Diane Kelly inadvertently worked with white-collar criminals. Lest she end up in jail, Diane decided self-employment was a good idea. Her fingers hit the keyboard and thus began her Death and Taxes crime caper series. 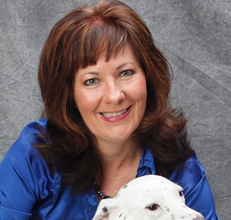 A graduate of her hometown’s Citizen Police Academy, Diane Kelly also writes the hilarious K-9 cop Paw Enforcement series. Sign up for Diane’s newsletter on her website and follow her on Twitter (@dianekellybooks) and Facebook.